Snakeskin leather accents? No, not the devil's guitar case. 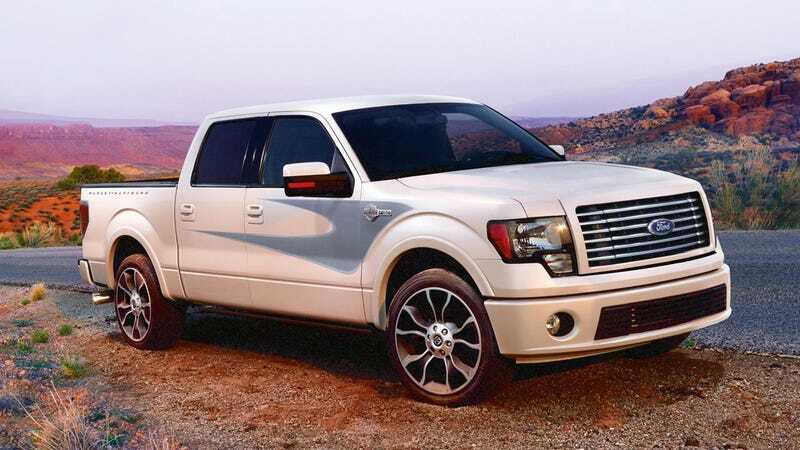 It's the 2012 Ford Harley-Davidson F-150, which gets a bit of snake action on the inside and out (interior accents and snakeskin texture graphics). Because bikers and snakeskin go together like shins and bruises. The newest Harley Davidson edition pickup also gets 22" wheels and a new premium color: White Platinum Tri-Coat. That's like wearing three coats, even though it's summer and your garden gnome just melted. Returning is the 6.2-liter V8 producing 411 hp and 434 lb-ft of torque. Either way, the Harley lifestyle just keeps on trucking — Ford's sold more than 70,000 Harley-edition bropickups since 1999. And not a single one of them — without a bed extender — can actually carry a Harley-Davidson in the truck bed. But whatever.